Noblesville took its next step in formulating the city’s future as it prepares for continued growth while balancing the “small-town” feel of the city through the recently completed housing analysis. The housing study was initiated as new council members requested more information on the city’s inventory to assist in basing decisions for potential developments. The information, statistics and demographics provide the whole picture of residential options currently in Noblesville. The study was conducted by Greenstreet Ltd.
“With this study, we are able to evaluate our current housing stock and plan for what types of housing should be targeted for development. Having the right mix of housing is important to Noblesville’s competitiveness locally and regionally. There are serious implications for the city if housing stock and neighborhoods continue to lack diversity,” said Noblesville Planning Director Sarah Reed. Families are no longer the largest housing segment in the United States. Household demographics are changing – locally and nationally – but the current housing stock doesn’t reflect that change. “We need to prepare for a shift in housing type from traditional families to empty nesters, young professionals, couples without children and nontraditional families,” said Reed. Today, 77 percent of what gets built in Noblesville (90 percent nationally) is single-family detached. But only about half of customers prefer that, leaving a third of households wanting something else without a way to get it. The average new home sold for $318,120 in 2016. Only about 10 percent of the population can afford the average new home. 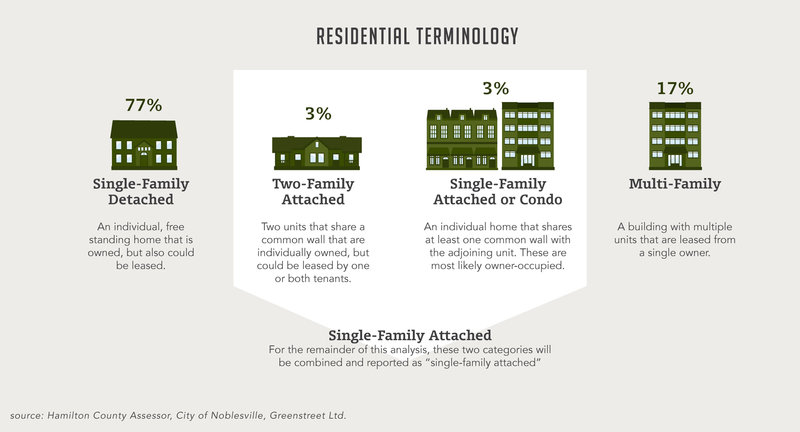 Of the 26,539 housing units in Noblesville, two predominant housing types exist: Single-family detached (77 percent) and multi-family complexes (17 percent). Most of the future inventory addresses only the far ends of the housing spectrum (single-family detached and apartment style multi-family) and will need to be absorbed before new product can be developed. The “Missing Middle” housing types include duplex, courtyard apartment, bungalow court, townhouse, multiplex and live/work units. Of the 3,894 lots approved in Noblesville, only 25 percent are currently under construction or completed. The current inventory of single-family detached housing and lots (both unsold units and vacant developed lots) could be absorbed in just under two years. At that rate of absorption, there is another 6+ years of platted lot inventory that may or may not reflect future demand. 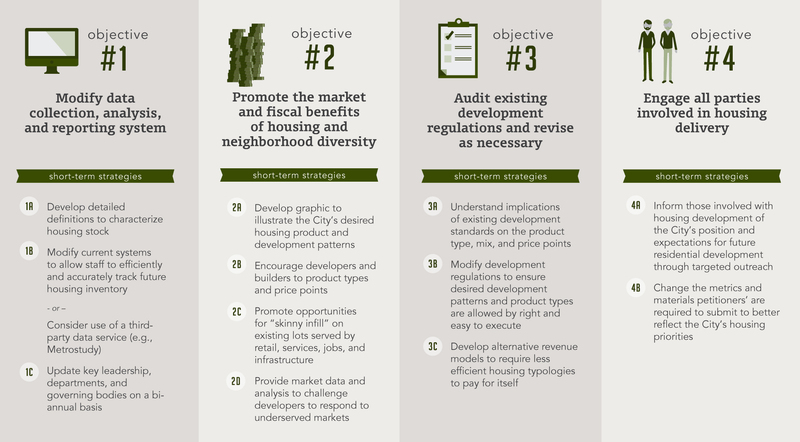 A short-term solution to diversifying the city’s market is to increase the variety of alternative housing types targeted to both renters and owners. This solution would not eliminate current products residents are familiar with but shift to types that are lower or nonexistent in our inventory. The next step for the study is to further educate decision makers, developers and the public. Moving forward, implementing the results be a collaborative effort among multiple departments within the city. “The goal after receiving this data is to discuss how much we want to grow; assess available land and identify areas for redevelopment; and strategize on what types of housing we want and where,” said Reed. With millennials waiting longer for marriage and advances in healthcare that allow seniors to live longer, future housing demand is changing. Over the next 15 years, half of all demand will be from single-person households. Nationally (as well as in the Midwest) average home sizes have gradually increased while household size has decreased. Noblesville homes have been consistently larger – nearly twice as big as the national average. In terms of lot size, existing single-family homes in Noblesville average 0.57 acres, triple the national average of 0.19 acres. New listings are down from 2015 putting pressure on current supply, and in turn driving up prices. The current inventory will be absorbed in just over two months. The average sales price of a new home is more than 30 percent higher than if a resident were to purchase an existing home. At $209,243, existing homes are affordable to approximately one-third of the population. The average new home sold for $318,120 in 2016. Only about 10 percent of the population can afford the average new home. Price is the No. 1 deterrent to first-time home buyers. In a 2016 national survey, 53 percent of first-time home buyers said it was hard to find homes in their price range. Low supply also was a factor as 35 percent said attractive homes sold fast. The average Noblesville home has an assessed value of $182,000 and sits on approximately 0.57 acres. Single-family attached units nationally are typically on smaller lots and with lower value. Based on natural population growth alone, Noblesville could expect to add about 500 new households a year for the next five years. Each year, 9,647 households move to Hamilton County. Approximately one-third of the households relocate from Marion County. On average, assessed values are lower than actual market prices. Even when looking at assessed values, lower income households would struggle to find housing in Noblesville that meets their needs. New construction is being built to the higher end of the market. Three quarters of the new homes (those constructed within the past 12 months) built would require a household income greater than the median income. When revenues and expenditures are taken into account, higher density development has a higher net fiscal impact than lower density options. On average it saves 10 percent on ongoing delivery of city services.